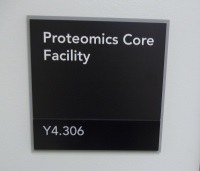 The proteomics core facility is in dedicated laboratory, office, and instrument space in the Green Biomedical Research Building (Y Building, South Campus). Our mass-spectrometry instrumentation is supported by computational infrastructure and software to enable us to get the most out of the data we acquire from your samples. The facility maintains a research focus to offer you state-of-the-art services, and our staff regularly publish in mass-spectrometry and proteomics journals (click for publication list). Please view the services section of our website to find out how we can aid your research, and contact us if you have any questions.